A couple of weeks ago, my friend next door asked if I wanted to teach jumping lessons to some of her dressage students while she was out of town. I’ve taught this group before, but it’s typically been as an assistant to my friend. I usually set courses, explain basic jumping concepts (like two-point position), and offer advice when it seems prudent. It’s fun- I like teaching, and the kids are good students. 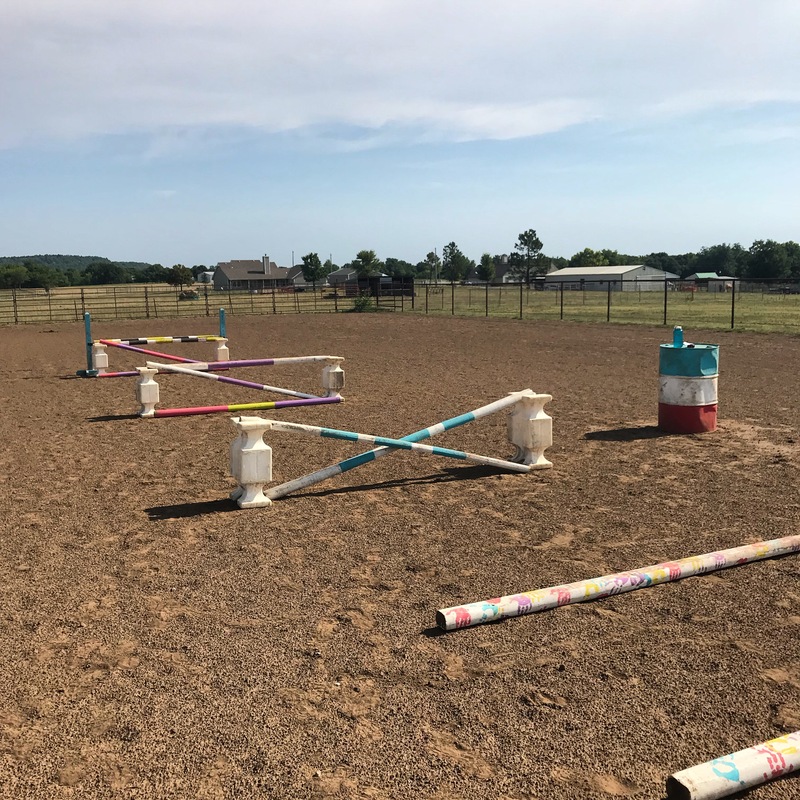 Grid set up for a jumping lesson! The majority of my teaching experience has been as a therapeutic riding instructor. The certification process for that required teaching under the supervision of an experienced instructor as well as testing to demonstrate my ability to develop lesson plans and communicate ideas and instruction. I passed that certification and spent years teaching riding skills to people with special needs. While many of my students were capable riders, they weren’t able-bodied. Teaching able-bodied students is different in a lot of ways than teaching people with physical or mental disabilities. However, the more I do it, the more I’m grateful for my experience with that kind of teaching. I learned a lot about breaking complex processes down into single, tiny steps. That’s really useful for anyone who’s teaching anything, really- explaining exactly how they need to arrange their body to achieve something is almost always helpful to the student! Megan at A Enter Spooking recently discussed the difference between “first toolkit” and “second toolkit”; therapeutic riding instruction is almost exclusively first toolkit instruction. That’s really handy when I’m explaining to a group of teenage dressage riders how they should apply their leg when approaching a jump, for example. Or how to prevent their horse from running out. Or what to do with their hands in two-point. These kids are good riders, but they’re completely new to jumping. Their second toolkit for this kind of work is basically non-existent. Giving lessons has also made me think about my riding. I’ve always tried to be a good example to the kids at the barn- my horses are always clean, I’m kind to them, I don’t (usually) ride like a sack of potatoes- but I feel like I really need to be on point if I’m going to tell other people how to ride! Teaching also makes me reflect on the gaps in my education and try to fix them. Have you taught other people to ride, or tried to help someone learn a new concept? Do you enjoy it? Does it make you obsess over your own riding skills? Me too! One of the things I like most about teaching is watching other people make the same mistakes I make and how that makes me think about what I ought to be telling myself when I ride! I can’t teach since I’m an ammy, but I have helped friends with their horses from time to time. Just free advice of course 😉 I rode at a barn for a long time that was very old school, and the trainer loved jumping but did not like nor care about flatting. Thus, she really didn’t get her students much education on proper flatwork. There was one kid that was a REALLY good rider, but she was easily frustrated because her pony would run out at fences, or not get to the right distances, and trainer would just tear her apart. Well that was all happening because the kid wasn’t riding the front end of the horse! Anyway, I’m rambling, my point is, one day when trainer was away, I helped her flat her pony and explained riding the front end, getting him on the aids, etc. It was really fun to watch it click for her and really made me think how to put what I knew from feel into words. Seeing someone “get it” (whatever “it”) might be is really rewarding! I always liked seeing my kids at the therapeutic riding center master a concept, and it’s just as fun watching this group of able-bodied students do so, too! I think this is the perfect example of the saying, “Watch one, do one, teach one.” Sometimes having to break down things and teach someone else is more helpful to you than it is to them! I know whether it’s horses or something unrelated, having to teach someone else only increases my understanding. I love the care and mindfulness you approach teaching with and I wish more instructors were as thoughtful about the process as you. I imagine it’s partially because you actually had to go through a system to teach versus just people in most equine industries hanging a shingle out for themselves.